First marketing, now sales! 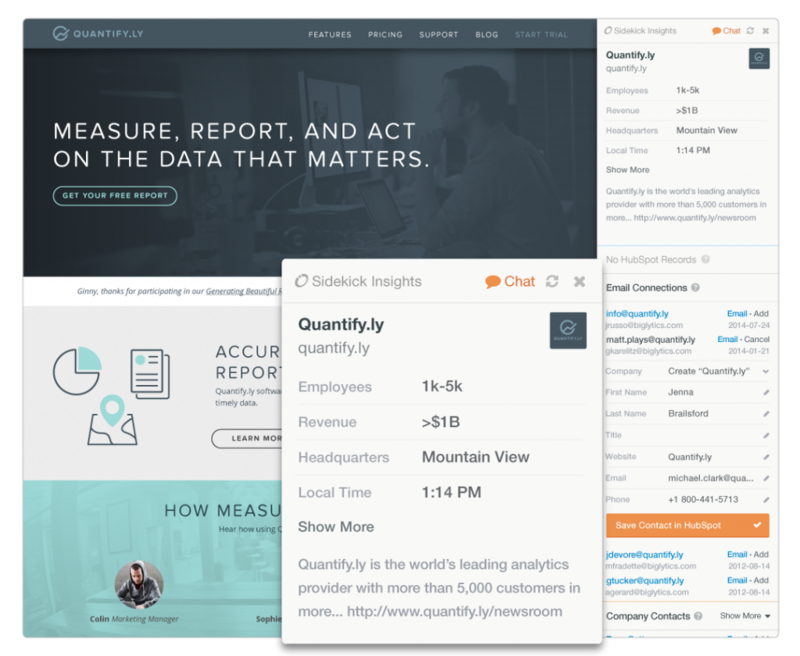 HubSpot has once again — in its oh-so-clear-and-simple style — taken a complex and hard-to-manage process and given us a tool that streamlines tasks and brings results: the new HubSpot Sales Platform, including the HubSpot CRM and Sidekick. During HubSpot's much-anticipated 2014 product launch webinar, Co-Founder and CEO Brian Halligan revealed the new product to partners, citing similarities between the "broken" marketing process (remedied by HubSpot's marketing platform) and today's traditional sales process. With intuitive and automatic features, the HubSpot CRM greatly simplifies sales activities, compared to current systems that prove to be complicated and manual. "Traditional sales technology is necessary but not sufficient," said Halligan. "HubSpot's Sales Platform is designed to arm sales teams with the context they need to improve how they engage with companies, prospects, and leads to drive sales instead of driving people crazy." To support the new CRM, HubSpot has also improved its current Signals feature, introducing a complimentary tool called Sidekick. Sidekick connects your e-mail inbox to the new HubSpot CRM, giving you valuable details about the contacts and companies you engage. Built around the way consumers shop and buy today, the two tools together will revolutionize the way sales teams organize and prioritize sales efforts. In our sneak-peek trial of the HubSpot CRM, we found 10 ways the tool will help our company, and yours, to grow. Finally, there's no more fighting with CRM integrations to get real-time closed-loop marketing and sales analytics. With HubSpot CRM, there's no need for integration because the system utilizes it's existing contact database that's easy to organize. All your marketing and sales information (both online and offline interactions) can be stored in one easy-to-access location, making it easier to keep your marketing and sales teams aligned. 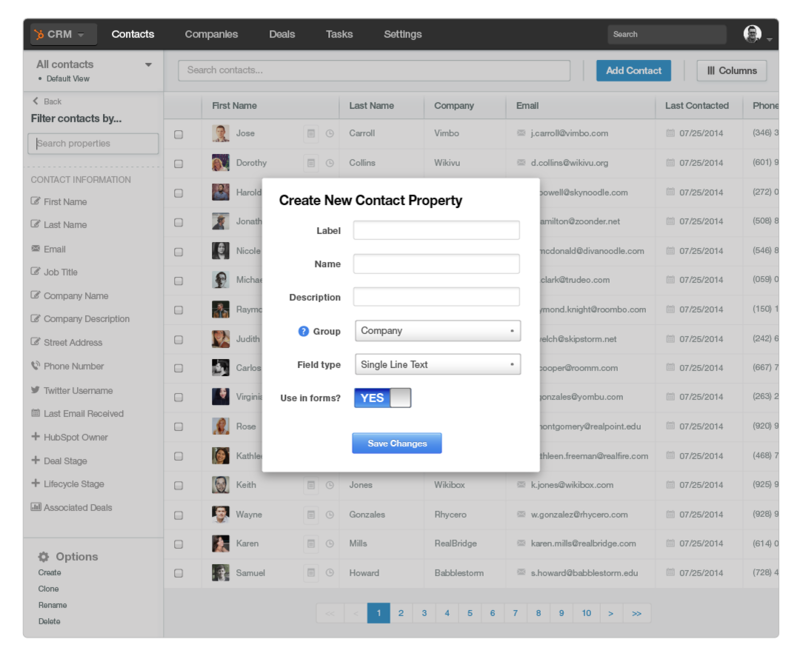 You can even create new custom contact properties inside the CRM! 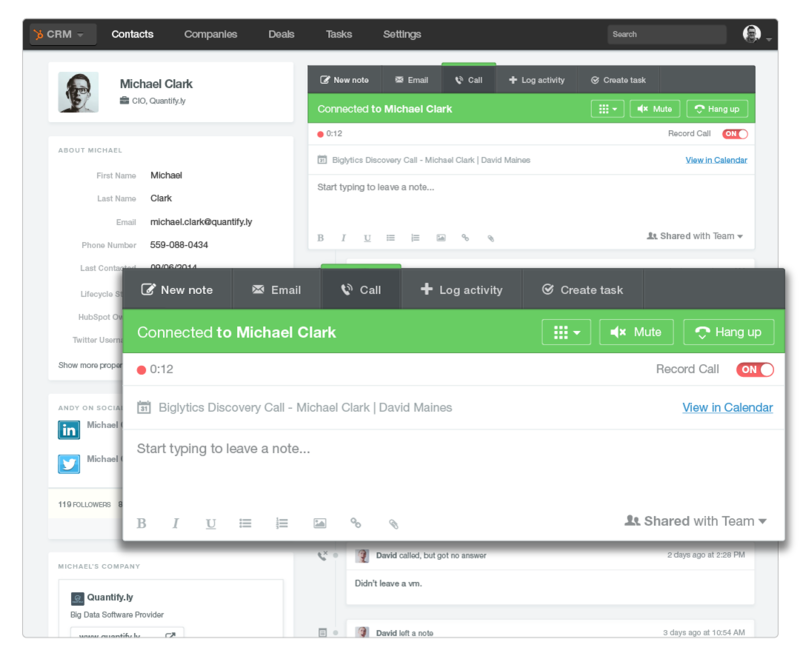 CRM view allows you to see your contacts' interactions and conversations at a glance. This makes it easy to pinpoint topics of interest and commonality and also to know exactly which content they are consuming on your site. This makes it easier to spark conversation and target your prospects' specific areas of interest for a more personalized experience. 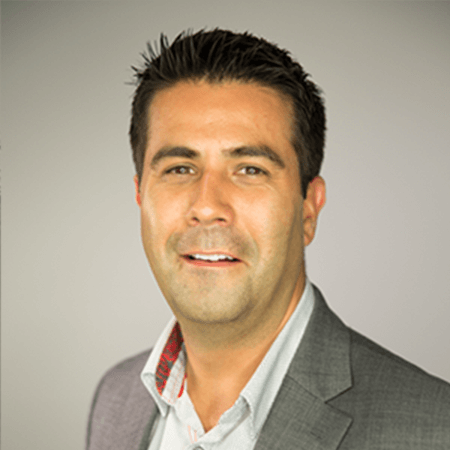 Do you ever feel like you're letting sales opportunities slip away? You won't worry anymore. 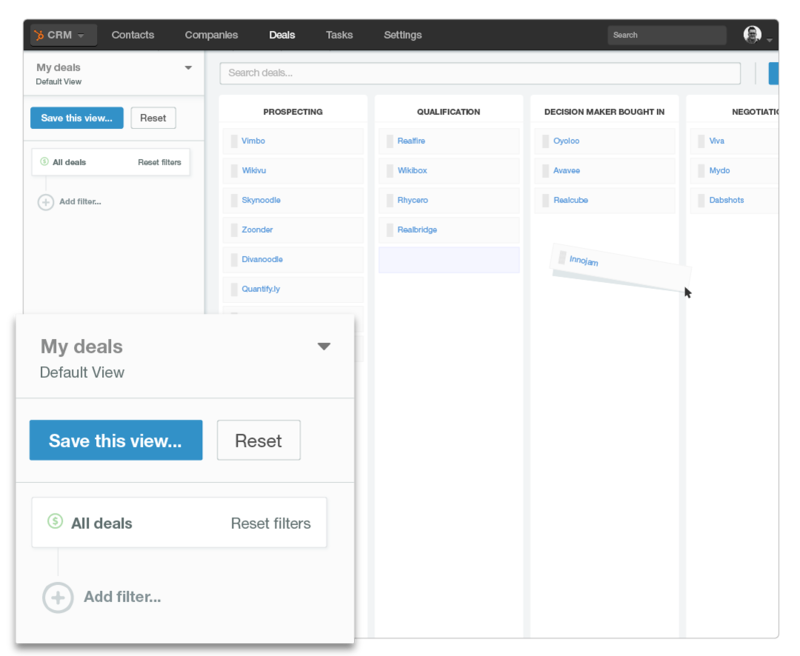 The HubSpot CMS makes it easy to create new sales opportunities and track them in the "Deals" tab view. This helps to keep your sales team actively engaged with all sales opportunities in real-time, enabling them to close sales faster. 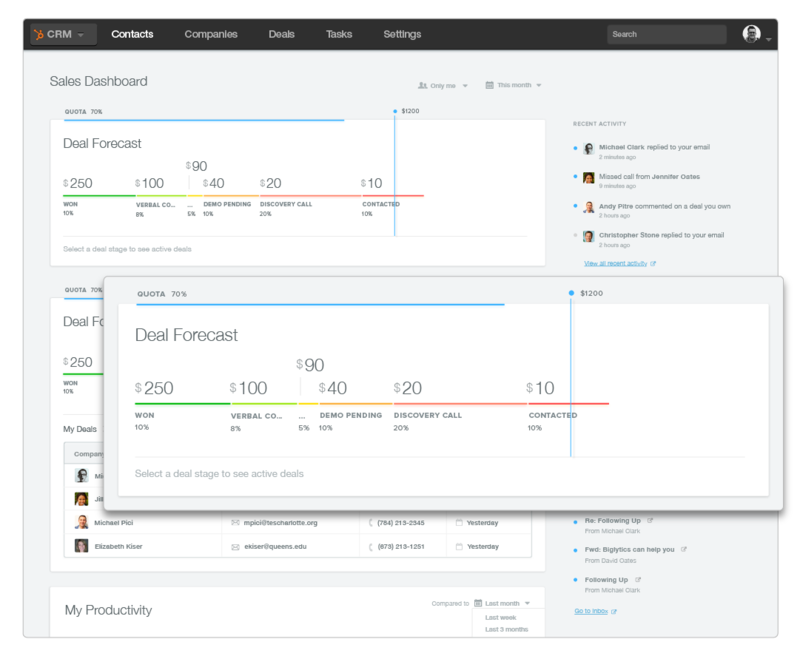 Now you can track your progress throughout the sales pipeline, making it easier to organize and prioritize your sales process. Ever wish you could go back and review that last phone call? Now you can! This feature not only gives you a quick refresh of your conversation, but it also helps your team stay engaged with the conversation as well. *Please note: This feature is optional and requires a separate monthly subscription and fee. Now you can simply copy and paste your meeting notes and conveniently store them with your contact's record. It's one tool and one location for all interactions with your contacts. Keep a list of tasks related to each contact inside your contact record as well. The tool will even send you a simple reminder! The navigation bar keeps your display clean and organized, but accessible and at your fingertips. Set up all of your upcoming meetings and events and add them to your Google Calendar with one click. 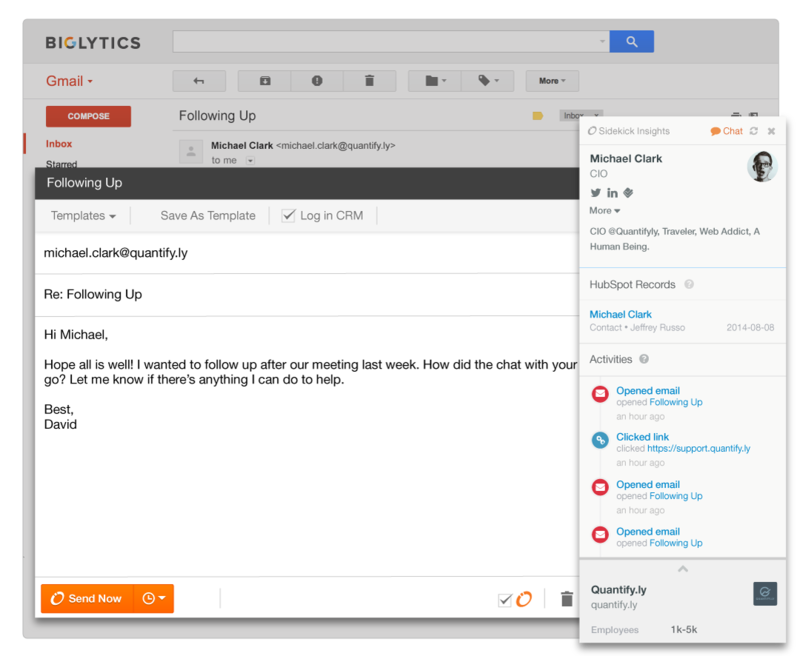 HubSpot CRM makes it simple to see your forecasted sales outlook. The Sales Dashboard makes it easy to stay on the right track toward reaching your sales goals. 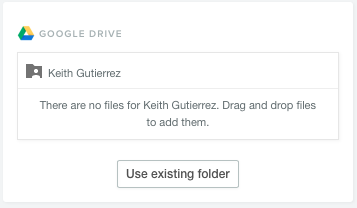 Keep all your related contact documents on Google drive, making it easy to find them, right when you need them. 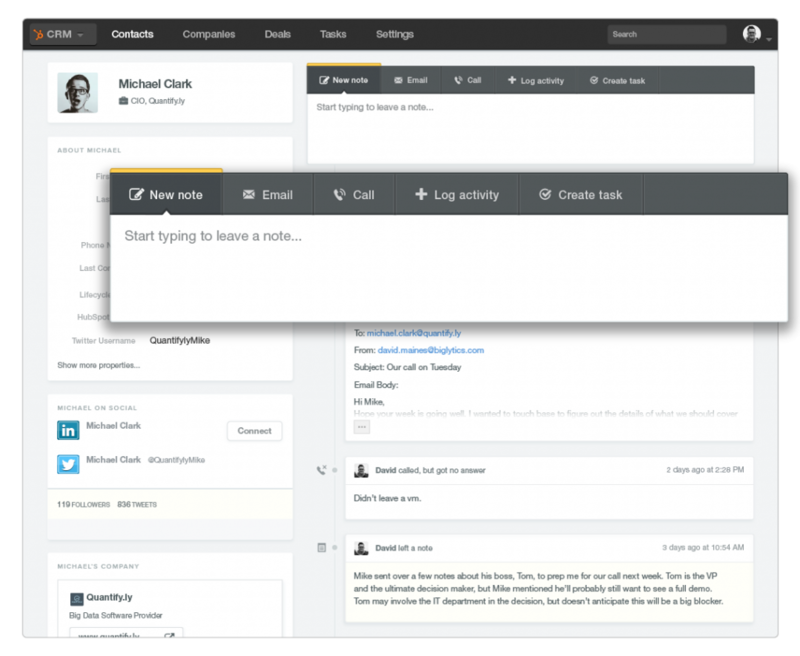 Sidekick is a complimentary tool that connects your e-mail inbox to the HubSpot CRM. While writing an e-mail, the Sidekick sidebar appears, showing interactions with your contact or company details that may be relevant to your current communication with him/her. 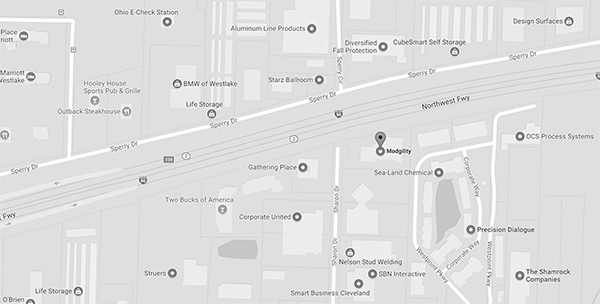 Real-time notifications tell you exactly how you're connected with your prospects and how they may have communicated with you or others in your organization. 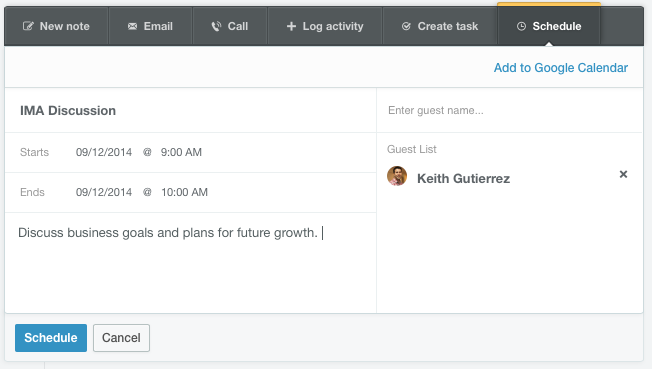 Sidekick automatically adds and organizes new contacts in the HubSpot CRM. Who couldn't use a Sidekick to "follow" you with valuable contact information as you work through your day? With the HubSpot Sales Platform, all the moving parts of the sales process begin to come together. Brian Halligan sees the connection between the new HubSpot Sales Platform and modern customer needs as a critical link in a company's growth and success. "HubSpot's CRM and Sidekick are perfect for companies that want to transform how they attract, engage, and delight prospects, customers and leads and want sales technology that matches today's buying process," said Halligan. As of the product announcement at Hubspot's Inbound 2014 conference, both products — HubSpot CRM and Sidekick — are being initially released in beta, rolled out in stages to current customers over the first month. Hubspot and Sidekick customers will have FREE access to the CRM tool and HubSpot intends to provide the same free access to all users over the next year. The Sidekick tool can be used for free for up to 200 notifications per month and for $10 per month for unlimited access. Additional paid options for Sidekick will be announced at a later date. 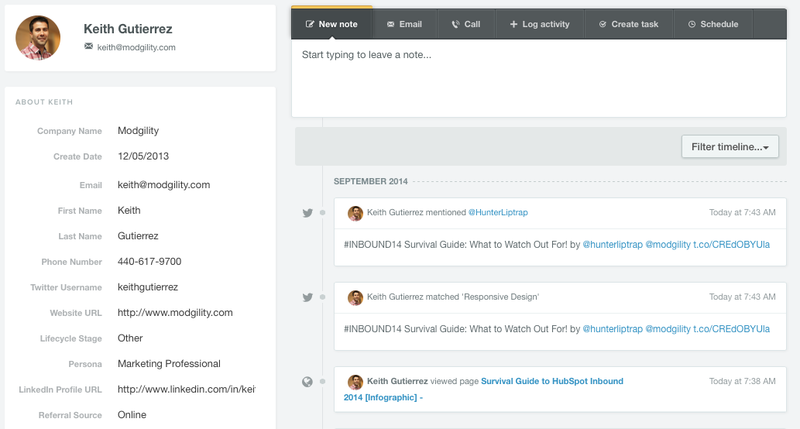 Current customers can request access to the new CRM at HubSpot.com/sales. After filling out a form, you'll receive instructions from HubSpot on how to access the platform. 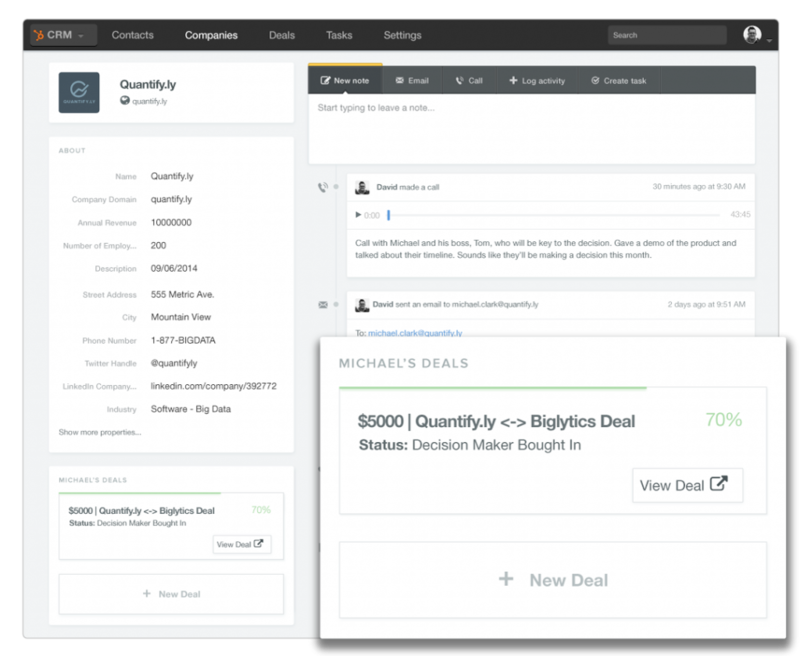 The new HubSpot CRM is a time-saving and easy-to-use platform built to respond to the way consumers buy today. Get your HubSpot CRM today — then get organized and get selling! What new HubSpot CRM features are you the most excited about? Let us know if the comments section below.